One of the lies told by Christina Stoy in her interview and article about me, is that publicly released documents contradict the timeline of my morning while searching for my abducted neighbor. to indicate that I was identified away from the area I was searching. This is an insinuation that while I said I was searching for an abducted girl, I was actually loitering in an alleyway. Shannon Stoy has repeatedly said that I was identified by an eyewitness in public documents. 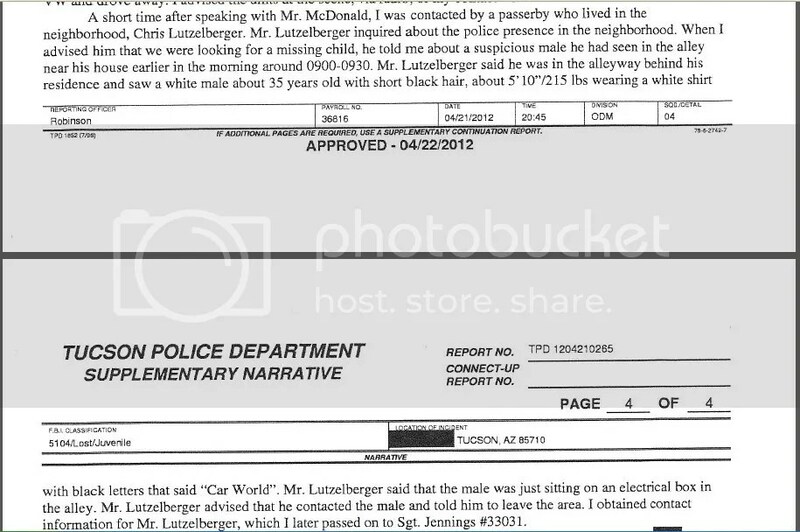 Anyone can read the pdf and see that no witness is on record asking me to leave being perched on an electrical box. Eventually, it’s so glaring a mistake, that she had to address it. After hounding her to correct her mistakes, she finally admitted that despite her claims that she was simply reporting on “PUBLICLY RELEASED DOCUMENTS” (she capitalizes that for emphasis), she actually wasn’t. She was reporting something that IS NOT (my capitalization, for emphasis) in publicly released documents. She has added details. Now, I spent a good amount of time contesting that detail, because I was never perched on an electrical box. Then one day, it occurred to me, that eyewitness lives in my neighborhood. Maybe he did identify me as a man perched on his electrical box. Maybe I was wrong! I doubted it, but it was possible. I walk my dog past his house pretty regularly. One night, driving home from work, I detoured and stopped. The next thing I knew, I was walking to his door and ringing the bell. I asked him if he had identified me to Officer Robinson. Turns out, he hadn’t seen me talking to Officer Robinson. He certainly didn’t ID me as the man he told to get out of his alley. He wanted to know why Shannon Stoy hadn’t called him. Then he said I should tell her to call him, as he had some things he’d like to say to her. I had a good laugh at that. So when Shannon Stoy says I was identified by an eyewitness perched on an electrical box in an alley, in publicly released documents, she actually means that I wasn’t. Whatever her source is, it contradicts the account of the eyewitness, and the information in the publicly released documents. I’d be very interested to find out who her source is that informed her of a conversation and identification that never happened. I won’t speak for Mr. Lutzleberger, but I got the impression he wasn’t happy that she’d put words in his mouth.